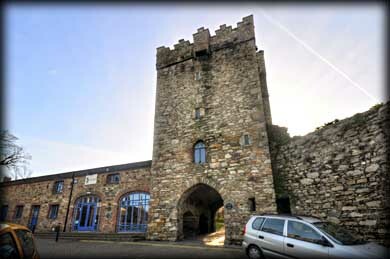 Westgate and Town Wall, Wexford. A stone castle was also built here in the 13th century but this was demolished in the 1730s to build a barracks. 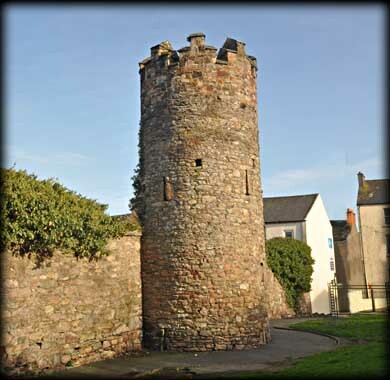 The town walls covered a distance of 1.25 kilometres, about 800 metres of it still remains today. The walls formed a narrow 'C' shape from the northern seafront west to the southern seafront. 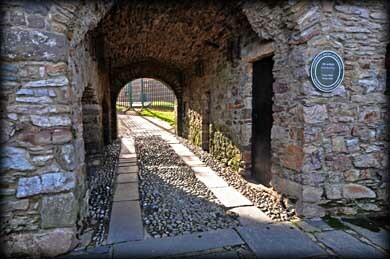 There were originally six gates, Cow Gate, John's Gate, Bride Gate, Peter's Gate, Castle Gate and Friar Gate. Selskar Gate was a private gate to the abbey. At some stage in the medieval period Cow Gate was renamed West Gate. But to confuse things even more, the original six gate ways were rebuilt in 1759 in a less substantial form and finally removed in 1835 and in the 1990s the Selskar Gate was greatly restored and is now known as Westgate. The town was targeted again by invaders in 1649 when Oliver Cromwell's army killed half of it's residents. Pictured above is an external section of the walls with the Selskar/West gate on the left, behind the tree, and the 15th century tower of Selskar abbey standing inside the walls. A few steps further south along is the mural tower, pictured below, known as the crusader tower. Another mural tower can be viewed from abbey street. 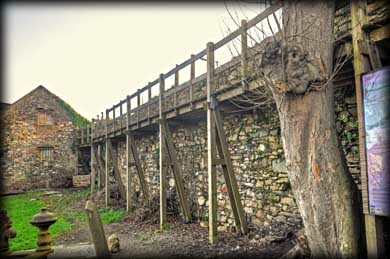 A modern timber wall walk has been erected inside the Selskar abbey section. For further information see Wexford Walking Tours who run daily tours of the town at 11am, (From 1st March-31st of October), starting from the Wexford Tourist Office. Situated: From Wexford Train Station head west on Station Road (R730). After 125 metres it bends right and changes to Westgate. The Selskar/West Gate is forty metres up here on your left. Discovery Map 77: T0451 2220. Last Visited Mar 2014.